Poor old Malaysia Airlines. The brand at the front of two of the worst air disasters in recent years. They have bravely stuck with their name and are soldiering on. When the travel agent said they had the best deal business class to get to Thailand I thought gosh what are the odds of there being a third disaster – and let’s help a poor struggling brand get back up and going! 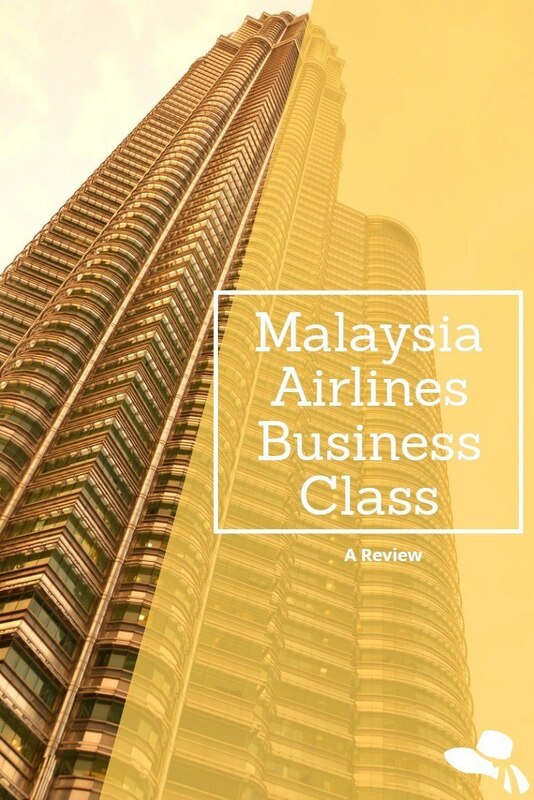 So off I headed – and here is my Malaysia Airlines Business Class Review 2017. I was on Malaysia Airlines A380 business class london to Kuala Lumpur on both legs of the journey. For the A380 it already feels a little bit tired. 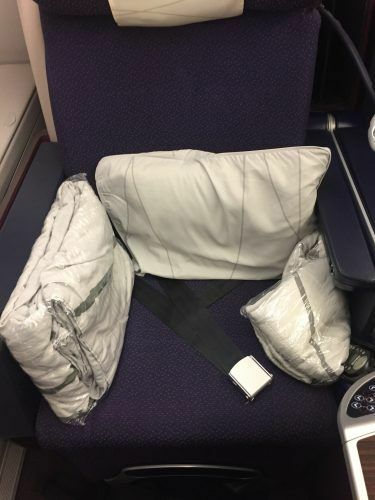 The seats are next to each other – you don’t have the privacy of the “pods” that many other airlines now have in business. The seats extend to a full bed and of course, once you are lying down you can’t see the person next to you. It is a little more awkward when you are the window and need to step over to go to the bathroom but there you go. You are supplied with a sort of base sheet as well as a duvet and pillow. Got a stop over in Kuala Lumpur? 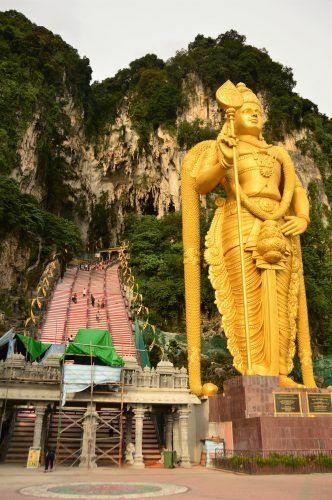 Click here to read my guide to a quick Kuala Lumpur stop over. 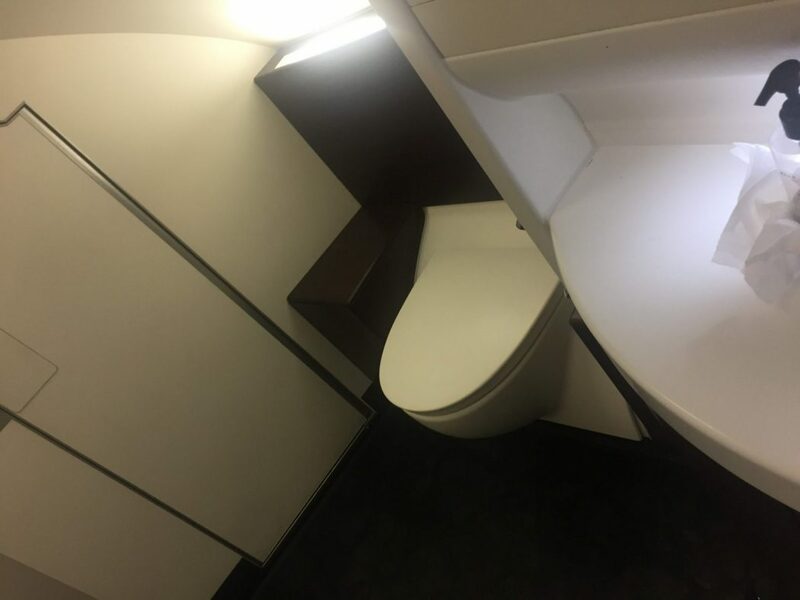 I did have the experience of visiting the largest loo I have ever seen on a plane! It was twice the size of the standard loo! It felt quite decadent! The in-flight toiletries weren’t great – Porsche design? Acca Kappa body lotion and lip balm – never heard of them? The entertainment system is decent. The selection of films was quite extensive as were the tv options. They are more extensive than say Etihad but less extensive than Singapore, Qantas, BA etc. But enough of a choice to keep you going. I was surprised that the entertainment options were the same on my return flight in January as they were heading out in December. I also flew from Kuala Lumpur to Bangkok business with Malaysia airlines. This was a more old-fashioned business set up with wide reclining seats but no beds – not that this was needed. It was a decent enough business class for a 2-hour journey. The food was a highlight for me – although I highly recommend you go with the local cuisine options as they were by far the tastiest. 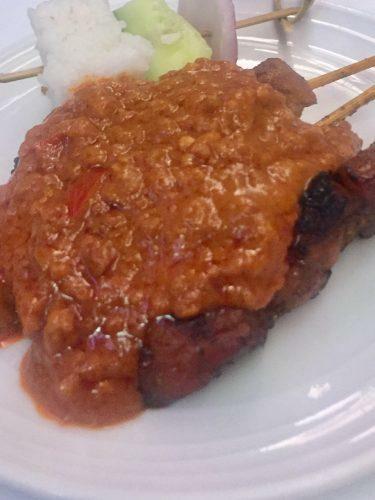 The best thing was the satays provided not long after take off! A man with a trolley piled high with chicken and beef satays comes around. The satay sauce is excellent! This is almost a giant amuse bouche before you head into the starter, main and dessert. I had the chicken rendang and the ayam masak merah in and out – both of which were very good. The egg noodles dine anytime option wasn’t as tasty – a bit more pot noodle plus. The Asian beef was a better option on return. The beverage selection was good. Proper French champagne. They had a nice Wairau River sav blanc as well. The service was good but not outstanding. It was a bit of a mix on the timeliness front – I waited a good 20 minutes for a drink once or twice but then everything else was very quick and efficient. 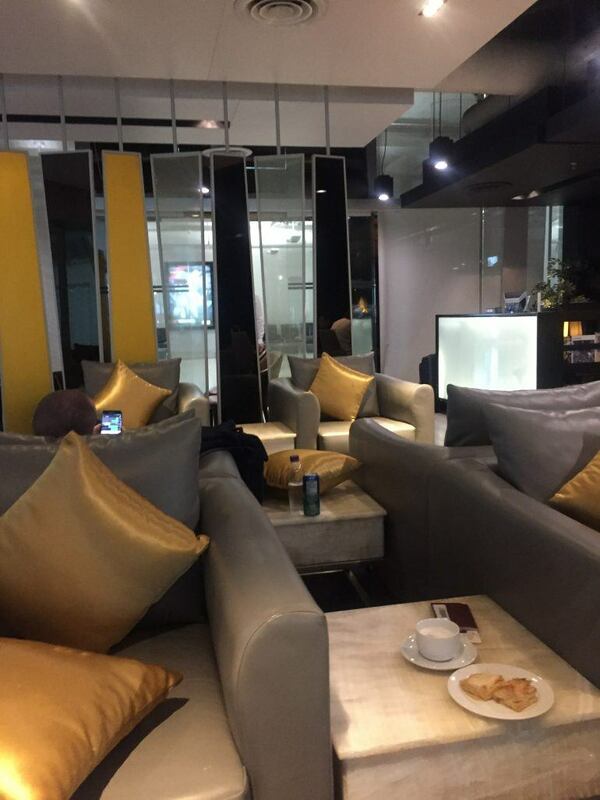 The Malaysia Airlines business class lounge Heathrow Terminal 4 was ok but nothing great. It is located near Gate 6 and is shared with Gulf Air. There is proper champagne which is very good. However, I arrived at 8 pm for a 930pm flight and the food options were very limited and not particularly appealing. It is quite a small space and there were minimal snacks on offer. But the wifi was good. 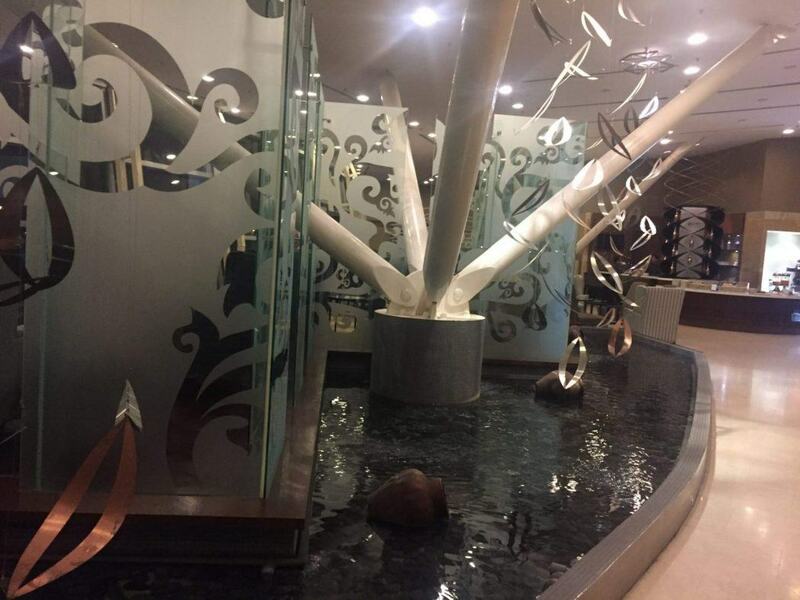 Arriving in KL Malaysia Airlines has 3 lounges. Kuala Lumpur is not exactly Changi – it is a dated airport. 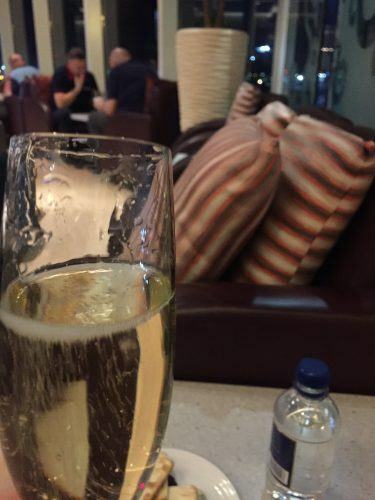 I used the lounge at H gate. The entry was impressive but it wasn’t as impressive inside. 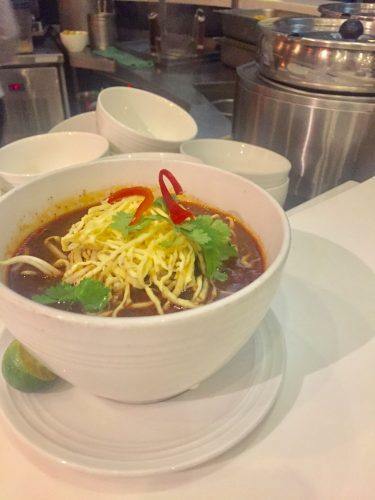 However, it did have a curry laksa bar which I tried and it was excellent! Heading out of KL I went to the lounge at the C gates which was much better. It is just above the trains that transport you across the terminals. It was a lot bigger and newer. However, like the rest of Malaysia airlines, it did feel a bit old and tired. How Good is Malaysia Airlines? Overall I would give the experience of flying business with Malaysia an average. I certainly think that Singapore, BA, Etihad and Qantas all offer a more modern and better business class experience. However, obviously, I flew with Malaysia Airlines because of the price. Most importantly you can get a decent sleep on the plane and there are good food and wine options. Perhaps if they modernized the lounges they would get me back again! KL Journal Hotel is located in the Bukit Bintang entertainment industry. It is a very tech friendly and hip hotel with free wifi, a communal work area, specialty coffee concept and even better a rooftop bar! Prices start from £65 Click here for the best deals and availability. If you are looking to stay near KL international airport check out my review of the fantastic Sama Sama Hotel which is literally at the airport. The transport links are fantastic and this is a great easy to stay in super convenient hotel. Prices start from £88 Click here for availability and best prices. Don’t forget to get Travel Insurance. You know, business class travel just has to be decent for it to be worthwhile, in my view. Crowded economy seats and indifferent fodder make travel a test of endurance, but business class just has to overcome those limitations. I don’t need to travel in luxury – that’s first class territory – just comfort and a chance to sleep on longhaul. I see business class as being the standard of air travel. It’s the way flying should be. Indeed, the way it was in the old days, when even economy passengers had a decent seat pitch and width. Nowadays, it can be an exercise in Tetris to fit everything in to the mean little space they give one. If airlines compete for business class luxury, with the suites and the freebies, then it has two effects. It invariably adds more space, which tends to be squeezed out of the economy cabin, and it widens the gap between premium and the rest. Most people I know fly a mix of economy and business. Why shouldn’t business class be just a better seat and more room? The same people use both products; they don’t suddenly become the great unwashed or the filthy rich depending on whether they turn left or right. I guess that’s modern travel marketing at work; getting bums on seats. Is there WiFi in business class on he A380 LHR-KUL? Gosh Beth I don’t quite remember which makes me think there wasn’t. Sorry not be more helpful! Have been on quite a few planes since – I will make a note to note this going forward.